In our conversations with agents and publishers regarding the Machine of Death manuscript, we’ve learned a lot about different ways to make our anthology unique in the marketplace. To that end, we’ve talked with many of our friends and colleagues in the world of comics (mostly webcomics, to be specific) and are currently commissioning full-page illustrations to accompany many of the stories in the book. We’re in talks with about 25 artists right now — and, if you follow comics, you know who these people are — and are in the process of finalizing contracts and assigning stories to be illustrated. 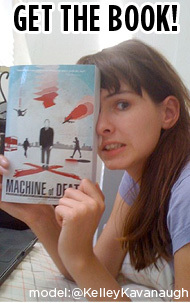 This will make Machine of Death a real jewel in the crowded field of prose (and specifically sci-fi) anthologies. Once all the arrangements are finalized — hopefully within a week or two — we’ll post the full list of artists here. This is a big step forward for Machine of Death, and we hope you’ll be as excited as we are about this new development!